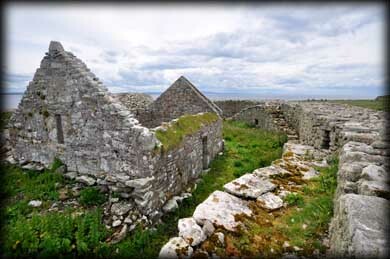 The early medieval monastic remains on the island of Inishmurray are certainly amongst the best preserved ecclesiastic sites in Ireland. The monastic site was founded by St Molaise in the 6th century. The main concentration of monuments are within the walls of a large pear shaped enclosure known as a cashel. The impressive 3 metre high stone walls are of drystone construction and are up to 4 metres thick. There are two lintelled entrances to the cashel as well as a number of creepways. Within the walls are several mural chambers. The inner walls are stepped in places, as seen in the image below. The cashel is over 50 metres in length and up to 40 metres wide, the interior is subdivided. Within these subdivisions is the main concentration of monuments. 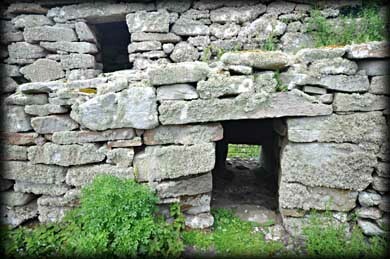 There are three churches, three clochauns or beehive cells, three leachta (Stone Altars), a number of possible souterrains, a cemetery and several cross pillars. The grass clad oratory is Teach Molaise, Templemolaise is the largest church and the third church is Templenatinny which is hidden behind the impressive clochaun known as Toorybrenell - the school house. Built onto Toorybrenell is another small beehive cell. In the northern subdivision is the third Clochaun known as Trahannacorresh. There is a possible fourth clochaun or sweat house on the exterior of the north side of the cashel. 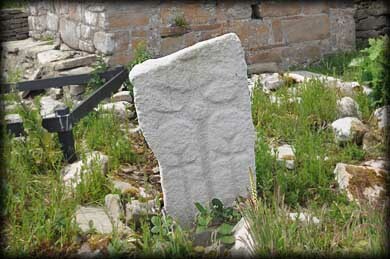 There were about ninety decorated cross pillars/cross slabs located on the island. 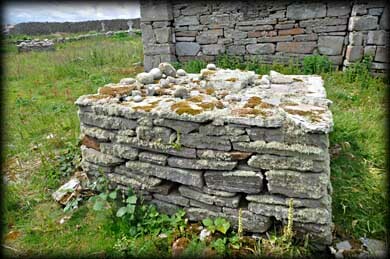 Approximately half of these were removed to the old schoolhouse at the western end of the island for protection. Several of these pillars, some of which are pictured above, are situated within the cashel walls. The most well known pillar is called the Birthing Stone. 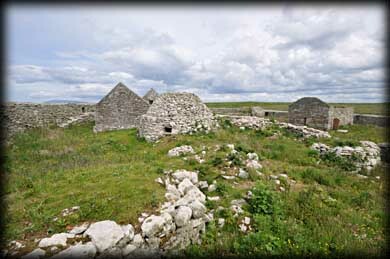 There were a total of sixteen leachta situated at different points on the island. Three of these are situated within the cashel. Pilgrims would start their rounds in the cashel and move around the island in a clockwise direction, stopping and praying at each leacht or station before finally finishing back at the cashel. 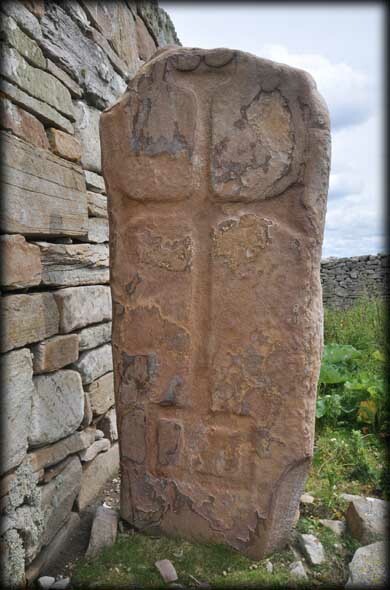 Each leacht has it's own name or dedication and decorative cross slab. 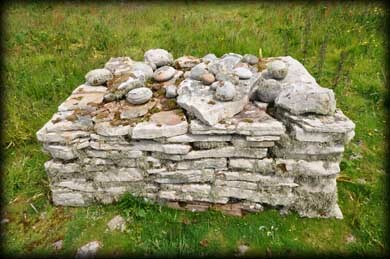 The best known is the Clocha Breacha with it's famous 'cursing' or 'curing' stones. Prayers were said and the stone was turned clockwise for curing and anti-clockwise for cursing. 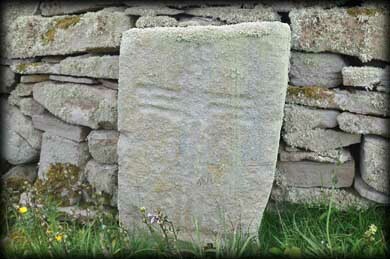 Fourteen of the many water-rolled stones at Clocha Breacha were richly carved.These have now been removed for protection and replicas are being made. See also the Crossatemple leacht and Laghta Columbkille. St. Molaise (aka Laisrén mac Decláin) Feast day 12th August. Very little is known about the founder of the monastery on Inishmurray. There are well over forty Irish saints named Molaise. One of these other saints founded a monastery on Devenish Island on Lough Erne in County Fermanagh. St Molaise is said to be the confessor of St Colmcille and the person who banished him to Iona. This has also been attributed to Molaise of Devenish. 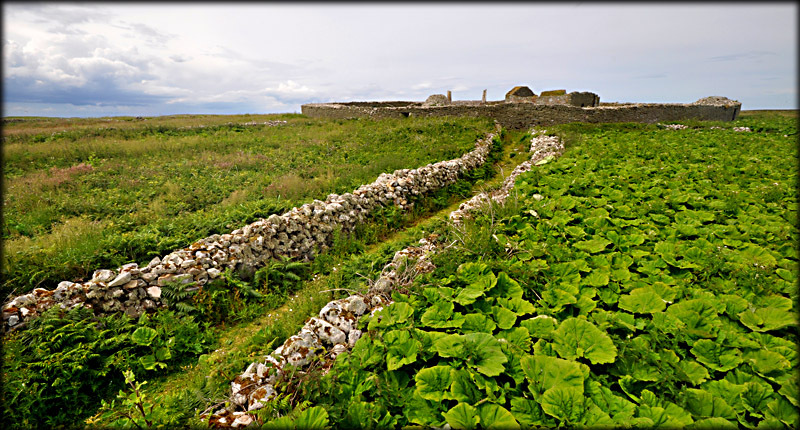 There is some support for the Inishmurray saint in that a few of the coastal parishes on the mainland with connections to Inishmurray also have some Columban association. Situated: The cashel is located along a track that runs in a northerly direction from the women's cemetery which is situated in the southern coast. Discovery Map 16: G 5738 5384. Last visit June 2012.